Every year, Pantone - the cardinals of colour, choose their ‘color of the year’. Their choice captures what is trending in design as well as being a reflection of what is going on in the world as a whole. This year, the ‘Pantone Color of the Year’ is a dramatically provocative and thoughtful shade of purple, PANTONE 18-3838 Ultra Violet. According to them, “Complex and contemplative, Ultra Violet suggests the mysteries of the cosmos, the intrigue of what lies ahead, and the discoveries beyond where we are now.” A little cryptic maybe, but the colour purple with historical links to mysticism and energy, is undeniably on-trend this season. Purple might not be your first choice when it comes to sofas, but it’s worth considering - we think you’ll be pleasantly surprised. With it's regal connotations, it will add sophistication and elegance to your home. Dark purple hues will add drama to your lounge, whereas lighter shades evoke a feel that is more soothing and relaxing. Whichever shade you choose, a purple sofa will make a stylish statement. Lavender, lilac, damson, plum, amethyst or aubergine; Ultra Violet isn’t the only shade of purple at your disposal. 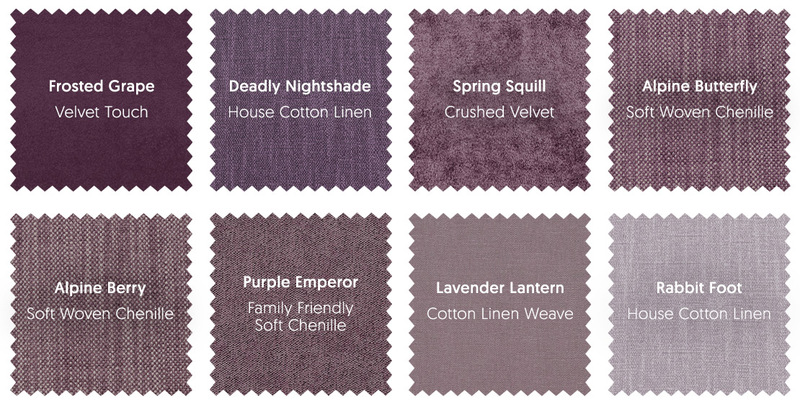 At The Lounge Co. you’ll find a beautiful edit of purples; from smooth velvet to soft chenille and even family friendly fabrics, there’ll be a purple that’s perfect for you. 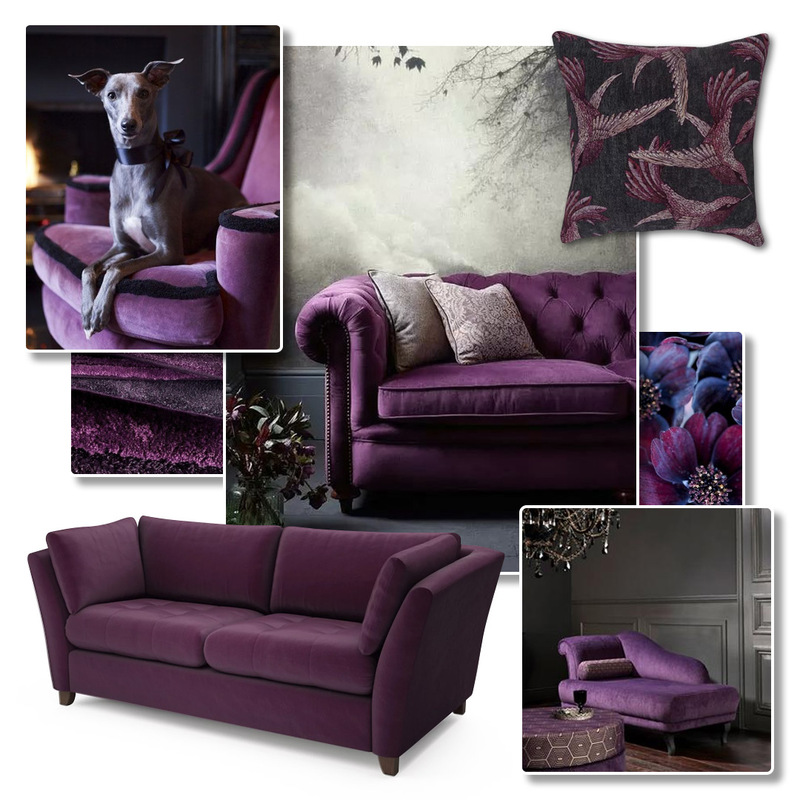 Want to see how purple is going to look in your lounge? 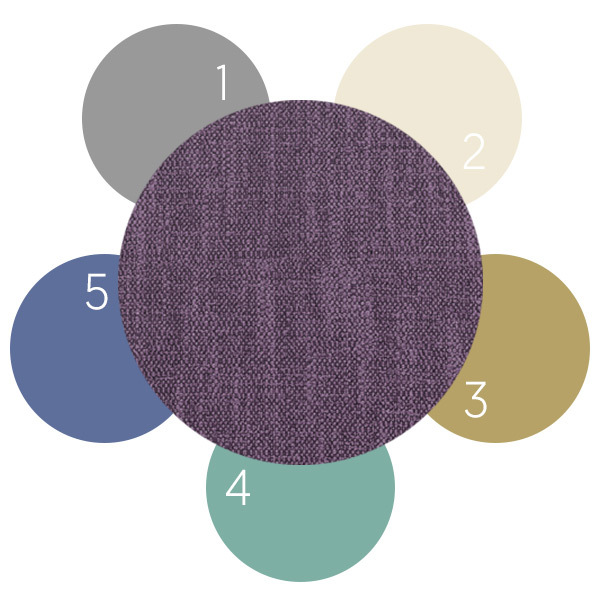 You can order up to 8 swatches for free, allowing to compare and contrast in the comfort of your own home. If a purple sofa is one bold move too far, why not introduce this gorgeous shade in smaller, bite-sized accessories. Our cushions start from just £40 and are a great way of introducing a pop of colour into a neutral interior. Our best-selling Paradise Bird - Mulberry will also add a punch of bold pattern. Feeling a little more daring? Why not try a footstool or accent chair in a gorgeous purple hue. Purple doesn’t rhyme with anything! It’s true! You won’t find a word in the English dictionary that rhymes with purple. Luckily though, you won’t find the same problem with colour partners! Purple is surprisingly versatile; match with a variety of shades to create interesting colour combinations. Here are some of our favourites.